A newly metamorphosed Vinayaka is set to make its one-night only world premier here. The simple and familiar tale of how the Hindu God Ganesha came to have an elephant’s head will be presented in a cross-cultural collaboration by Bhaskar’s Arts Academy, Sasana Budaya Art Troupe (Indonesia), and Singa Nglaras Gamelan Ensemble (Singapore). Vinayaka was first staged as a Bharatanatyam piece in 2003 and then again in 2005 by Bhaskar’s Arts Academy (BAA). In 2010, BAA reworked the piece with Balinese elements and it premiered in Bali. In this iteration, Vinayaka has taken a new form that is expressed through Bharatanatyam and Javanese movements under the artistic direction of Santha Bhaskar, as well as choreographers Meenakshy Bhaskar and Santi Dwisaputri. The piece will be performed to a new and exciting score under the music direction of Ghanavenothan Retnam and Sambowo Agus Herianto. “I have choreographed this work several times now but each time it feels so new. I connect with it differently each time and it is as if I transform along with the work” says Meenakshy Bhaskar, who is based in the US. 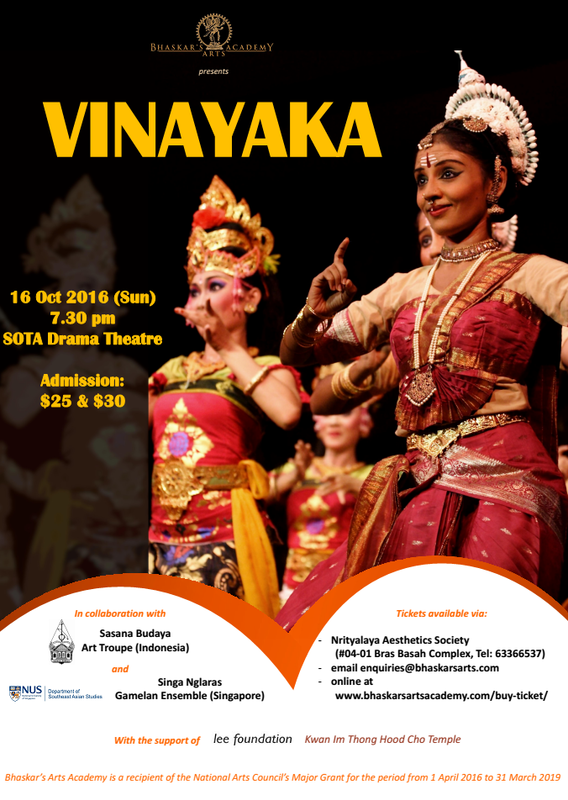 Vinayaka is the first of a three-part series by Bhaskar’s Arts Academy that will present works under the umbrella theme of “Traditional Arts in the Region.” Exciting collaboration with other performing arts troupes from different ASEAN countries can be expected in the coming years.